Rise of the Planet of the Apes (2011) – WHO IS THE MAN FROM KRYPTON? Rise of the Planet of the Apes tells the story of an above intellect ape called Caesar and his upbringing with Will, played by James Franco. Will is a scientist who is developing a cure for Alzheimer’s and other degenerative diseases. Caesar is the child of one of Will’s test apes and when things take a wrong turn at the lab Will is forced to get rid of all the apes, yet decides to keep Caesar. But then, years later, Caesar makes a mistake and is sent to a “sanctuary” for apes and through his poor treatment decides to teach the other apes and form his own army of apes, which he gains through various means. James Franco plays Will Rodman, the scientist and carer of Caesar and successfully puts across to the audience that he is a capable scientist, with high levels of intellect yet also shows a caring compassionate side for Caesar and his father, played by John Lithgow. Speaking of John Lithgow he puts in a great and convincing performance of a person struggling with Alzheimer’s then flipping to a fully functional person with nothing wrong with him. Freida Pinto puts in a decent performance and with the little screen time she has, comes across as the love interest, nothing special, but by no means takes away from the film. The star of the film is Andy Serkis, who does the motion capture for Caesar. Serkis is a master at getting into these characters, he is believable in whatever role he attempts, Caesar is no exception, he gives Caesar heart, emotion and humanity. The simple facial movements, the emotions in the eyes, the body language, every fine detail just gives Caesar an amazing personality, despite having no voice. Rupert Wyatt does a good job considering this is only his second movie. Although the camera angles and the set ups of the shots are nothing we haven’t seen before, the action scene’s involving the apes are set up imaginatively and beautifully. The preciseness present in these scenes are amazing and some of the scenes are extremely powerful, the helicopter scene comes to mind. Going into this film the first time, before i started this blog, i wasn’t expecting much, just for it to be a mindless action film. I was extremely surprised at how deep this movie was. 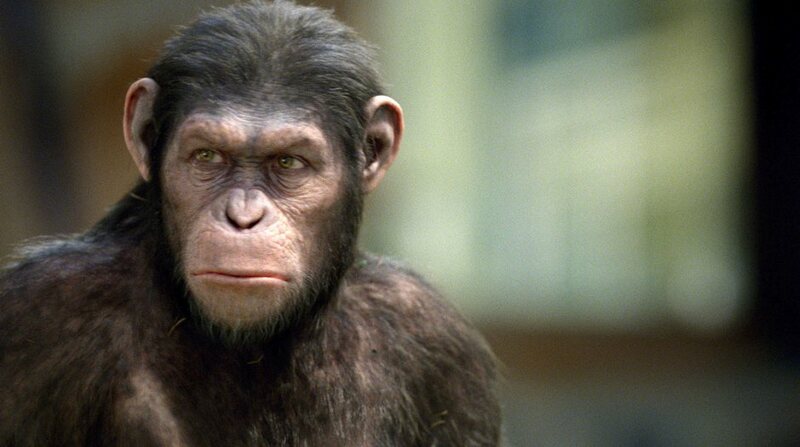 The first half of the movie sets up the story of Caesar and the vaccine being worked and tested on apes. The second half is about the rising of the apes.This, almost equal, divide is extremely well done and sets up the story so that you fall in love with these characters and then watch how they change. The apes simply look outstanding, it is a testament to WETA and their attention to detail. The apes look completely real all of the time, you truly believe that these apes are real and not CGI creations. The performances are great, the story is good with a few jaw dropping moments and there is plenty of spectacle with how real these apes feel. Rise of the Planet of the Apes is a great film with some minor problems which do not affect the overall enjoyment of the film.